It's Harry's birthday in less than two weeks away and I can't believe how quick it's come around. It literally feels like it was only his first birthday a couple of months go. With Christmas just a few weeks before his birthday I was struggling with ideas on what to give him or at least whether to give something for Christmas or keep it back for his birthday. I then realised I didn't have a "main present" so was struggling for ideas as I find it so much harder shopping for boys than girls especially as he has a lot already! But I did find some stuff which I think he'll really like so I thought I'd share what I've bought him for his birthday this year. This is one of his main presents and was kind of last minute as I had ran out of ideas until I remembered that I had thought about getting Harry the Wishbone balance bike but just couldn't justify the cost especially incase he decided he didn't like it. So I found this balance bike for a bargain at just £25 and of course when I saw it in white and black i just knew I had to buy it! I bought this safety helmet here and some star stickers which I'll add on too which will look super cute! Harry had a little JCB ride on which he absolutely loved and rode every day but I gave it to his dad to have over there as I didn't have the space for all of the toys before Christmas. I had been eyeing up one of the bigger battery operated cars but at £150-250 and the fact that we'd have no where to store it as I don't have a garage it felt pointless. So I decided to get him one of these ride on/push along cars at the fraction of the cost and it's a lot smaller! Perfect for playing with in the living room. Another of his main presents is this Little Tykes scooter. I had actually bought Harry a Finding Dory scooter for Christmas but thought he may have been a little small for it so I've decided to keep it until next Christmas for him instead. I had been looking for black and white scooter for his age and couldn't find one but came across this and I really like it. I really like the Micro Scooters but I wasn't able to design my own in the colours I wanted so opted for this instead. It's for ages 2-5 so perfect for his age to get plenty of use out of it and I can't wait to take both of the kids out on it together as well as go on adventures with Harry on his own whilst Amelia is at school. I thought this Scootaheadz dinosaur would make scooting about a lot more fun so couldn't resist buying it and have heard lots of great things about them. They look pretty easy to install and come in lots of different designs, so I think I may buy Amelia the unicorn one. I bought Harry the star drum for his first birthday and had been wanting to buy the guitar but thought he was still a bit young at the time. So I've finally bought it to match his drum. Amelia got the Deluxe peppa pig construction house for Christmas which they both argue over on a daily basis so I thought I'd get him his own little one to play with as he's Peppa Pig obsessed at the moment. As I mentioned Harry's really into Peppa Pig right now, so I thought I'd build up his collection. He has the cars already and a Peppa pig play mat so I thought he'd like this. Harry got a ton of Lego Duplo sets for Christmas and has loved playing with them so I thought I buy this deluxe box of fun set for him to add to his collection. He never had any duplo before Christmas and always loved playing with the megabloks but I feel that he outgrew those. I got Harry the Ikea Duktig play kitchen for Christmas which I hacked and turned into my dream kitchen. He loves playing with it and so I thought I'd buy a wooden toaster and coffee maker for him to play with. So that's everything I've bought him so far. Amelia saw me buying the Peppa pig house online and wanted to buy him a birthday present so I said she could give the peppa pig toys to him from her. What did you buy your two year old for their birthday? Great list, I still haven't made up my mind for Chloe. Ha I think she is still too young for a balance bike. Maybe I am wrong. She doesn't have many girls toys. We got George a balance bike for Christmas and he loves it, he was two in September so hopefully Harry will love it just as much! Can't wait to take him out properly on it once this baby has evacuated me! I wish I had bought Elliw a balance bike! I will definitely be buying one for Freddie when he is older. Nice post. 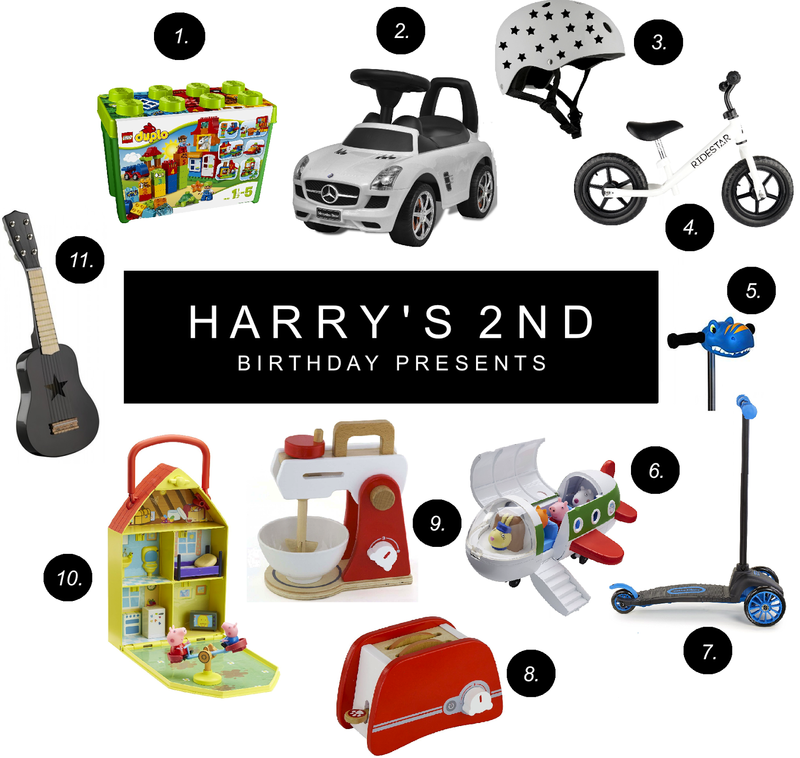 And wonderful gift ideas, Happy Birthday to Harry. Web Hosting in Pakistan is a Cheap Hosting and Domain provider in Pakistan, We Deal in Web hosting, reseller, Domains and VPS in Pakistan. PK Domain Web Hosting in Pakistan is a Cheap Hosting and Domain provider in Pakistan, We Deal in Web hosting, reseller, Domains and VPS in Pakistan. we are cheapest, best free web hosting & PK domain registration services provider company in Pakistan, get vps and Dedicated hosting in cheap rates. Give your business an online presence with us today at www.pkdomain.com.pk. i have two kids 5 years old and 9 years old, they are my precious one in life.. i have been through pain and bitter, i cry every night when I'm alone on my bed.. but today i thank Dr.happy for wiping away my tears and bring back joy to me again.. 5 years ago, my husband left me with my kids for no reason, i try to make peace with my husband because i love him so much.. but my husband never give me any chance, ..he dislike the kids for no reason. and i tried a lot of spell caster to know where the problem was coming for and why my husband left me to another woman, but the spell caster keep asking me for money and i keep paying to them without knowing they where fake and scam.. after losing $4000 to different spell casters i was broke and confused in life, but one day, i travel to south Africa for a wedding parting then i meant a man and his name is andrew pulen, he was so friendly to me and with that i make friend with him and also tell him about my marriage problem and how my husband left me to another woman.. i cry so bad. but my friend told me not to worried.. my friend introduce me to this spell caster whom i explain all my problem to, this spell caster told me what to do and he also tell me the problem and why it happens ..